It’s been a busy summer for the team at Dodd & Co and it doesn’t get much less busy as the nights draw in and the weather gets colder. This is the time of year when we need to consider how we get onto the land to do fencing and construction work without either a) getting machinery stuck in mud or b) churning up the earth with our heavy equipment. Luckily we have a talented team of craftsmen who all adhere to our principle of top quality work and high levels of customer care. As we reflect back on the past few months, one thing that really stands out is how varied our workload is becoming. Dodd & Co began life as a fencing company, with the occasional foray into agricultural building work. Now, through experience gained, as well as the growing skill set within the team, we are able to take on far larger and more ambitious projects. An arena and additional stabling and storage space for an equestrian business. This included a mirrored wall so the riders could check their riding position and the horse’s gait. A handling system and fencing for a large deer operation. A porch, outbuilding and path for a period farmhouse. Decking, verandah and outbuildings for a property overlooking the coast. 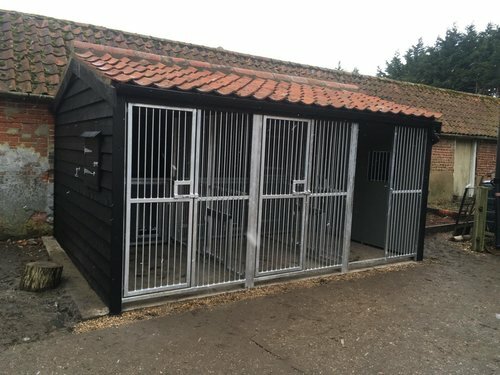 Kennels and exercise area for gun dogs. Kennels, exercise area and specialised fencing for a Husky breeder. Security fencing on an industrial site. Security fencing for company growing specialist crops. We also regularly work with organisations such as The Norfolk Wildlife Trust and the PACT Animal Sanctuary to create safe environments for wildlife and rescued animals. And we work in partnership with companies such as King’s Lynn Construction when they need our specialist help in complex projects. At Dodd & Co we pride ourselves on the high level of service we offer. From the beginning of the project through to its competition and aftercare, we constantly stay in contact to ensure that everything is exactly as you want. We do not compromise on the quality of workmanship or the quality of materials used.